Marketing trends come and go, but social influencer marketing is likely to enjoy the spotlight longer. As a matter of fact, 84% of marketers said they would launch at least one influencer campaign within the next twelve months. The rise of social media platforms, particularly Instagram, fueled the explosion of influencer marketing. The trend is now rated as the fastest-growing online acquisition channel. It even beat paid search, email marketing, and print advertising. Influencer marketing deeply relies on word of mouth and technology. It helps brands reach a wider yet tailored audience. And if the campaign is authentic and relatable enough, it can generate new leads and strengthen the company’s reputation. This week on Five Tips Tuesday, we’ll help you understand and leverage social influencer marketing. Discover the six steps to a successful influencer campaign. Find out the benefits it can bring to your business. Check out the social media influencers you should follow. Learn how big the marketing trend is and where it’s heading. Lastly, get the book that will help you become a better persuader. Like other marketing tactics, launching an influencer marketing campaign comes with many challenges. Finding the right influencer and maintaining authenticity are just a few of them. But with proper planning and research, you can easily surpass those challenges. Here are the six steps to a successful social influencer marketing. Due to its popularity and effectiveness, influencers should be part of your marketing strategy. Aside from helping your company grow, it can also aid in building a solid partnership with your consumers. Check out this blog to find out the big benefits of using social influencer marketing. As a marketer, following the popular influencers can teach you many things. Being aware of their personalities and behavior will give you clues on what customers want to see. They can also update on the booming trends. In short, knowing the popular influencers can help you find the right influencer for your brand. Here are the top social media influencers you should follow. Still not convinced if you should exert time and money to influence marketing? Are you worried that the trend will die soon? Check out this detailed infographic to learn how mainstream it is and where it’s heading. Understanding the science of persuasion is a must for every marketer and entrepreneur. “Influence”, the classic book about the psychology of persuasion, will help you become a skilled persuader. Written by Dr. Robert Cialdini, this highly acclaimed book will serve as a driving force for your success. 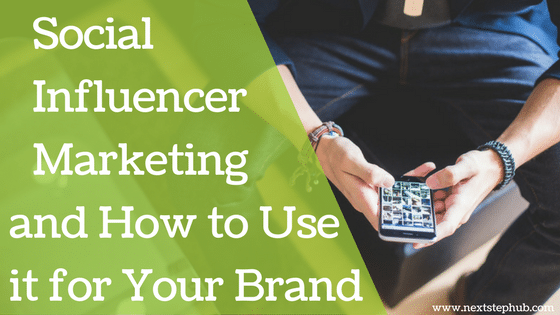 Do you have other tips on using social influencer marketing? Tell us in the comments!